The aftermath of a car or truck crash can be devastating for anyone. The short and long term consequences of such an event are obvious. They can range from severe injury to the need to get back on the road again. The cost of medical care or even a funeral can destroy a family’s accumulated wealth and serve as an unwelcome shock. When looking to get back on your feet, the accident victim and their family have two major avenues to recover, which are often intertwined. One is for prompt medical care, and the other is for legal attention. Choosing the right car accident lawyer can be as important as choosing the right doctor, and only the most experienced and well-trained can do. In cases like this, the services of an attorney at Ehline Law is second to none. We can be reached at (213) 596-9642 all times of the day or night and will come to you anywhere in the state for a free, no-pressure consultation. Our attorneys work on contingency and don’t ask for a cent unless we recover for you. We allow for our experience and reputation to speak for itself both in and out of court and don’t give up on our clients until they are in a much better position than when they came to us. Please contact us for more information. Our attorneys have been involved in many cases in and around the greater LA area, helping clients from every background. We have recovered over thirty million dollars for our clients, often allowing them to rebuild their life fully. Below you will find other cases where we have been able to intervene successfully on these victims’ behalves. We are different because of our own background. We are local attorneys, born and raised in Southern California and understand the legal system in local courts and the traffic patterns of the region. Our experience as car drivers and motorcycle riders ourselves is reinforced by seeing the hectic situation across the LA area every day. Thousands of cars, crowded crosswalks, construction work, reckless and drunk drivers, and miles of concrete are a recipe for accidents and we aim to help those that need it. We’ve been able to study many recent accidents to determine the best way to proceed. Our lead attorney, Michael Ehline opined on the legal details of Caitlyn Jenner’s fatal crash on Ehline Law’s site here. We have also taken note of the distressing statistic cited by LA Weekly that Los Angeles is the second worst place for pedestrian deaths in the country, with 99 deaths. As a matter of fact, LA is only behind New York, with 121, but also with well over twice as many people. While the average number of car accident fatalities involving pedestrians is 14% nationally, it was an astounding 41% in Los Angeles. California also led the nation with the most pedestrian fatalities in the country with 612 annually. It has also been noted that over half of these types of accidents are hit and runs. The Los Angeles Times also picked up on this trend with its own review. According to statistics, 36% of fatal crashes were at intersections, compared with 22% nationally. In addition, it was also noted that the number of fatalities was higher at lower speeds than the national average. Each one of these injuries represents its own set of challenges to be cognizant of. Make sure that you receive the correct medical attention upon consulting your attorney. The cost of such medical care can be enormous, especially when paired with long-term therapy. Many patients also report severe emotional distress as a result of these accidents, which must also be factored in. Some of the most severe types of injuries following such an accident include head and brain trauma. Such injuries are often life threatening and require extensive specialized care. Damage to different parts of the brain can cause various short and long term effects on the patient, often resulting in their lifestyle changing significantly. Ehline Law has built partnerships with various medical professionals to pinpoint the exact issue and treat it with the utmost care. We can also help find doctors to assist you at every stage of the process, and in some cases, be able to pay for your bills up front. Our team has worked extensively on head injury cases and are able to determine causes for the accident and means to help rectify the situation. There have been many efforts in the recent past to make the state a safer place for pedestrians, bikers, and drivers. Some have worked wonders while others have not done as well. In 2014 the state legislature passed and Governor Brown signed the Three Feet for Safety Act. This mandates that drivers give at least three feet distance to bicyclists on the road. The law, that can be seen on the CA DMV site here, specifies fines that can be levied against drivers that do not give adequate space, ranging from $35 to $220. Last December, Red Thumb Day was utilized as a means to prevent texting and driving. This project had drivers paint one of their nails red to remind them not to text and drive. This partnership included NBC and Nissan and allowed for greater recognition of the dangers of using the phone while operating a motor vehicle. Unfortunately, with the rise of such technologies, the rates of texting and driving has increased and will likely only increase. California also took the lead by making lane splitting legal for motorcycles. While this law is not perfect, as Michael wrote earlier this year, it does represent at least some sense for the safety of motorcyclists, who are often injured and killed at much higher rates than car drivers. Safety should be the single most important factor that people consider when purchasing a vehicle. Not all cars are the same and many come with stellar reports. Others can be near deathtraps for drivers and passengers. With this in mind, there are several car brands that have developed quite the reputation for safety and reliability. We’ve been able to compile a list of some of the safest cars on the market today, according to IIHS, government, and consumer publications. 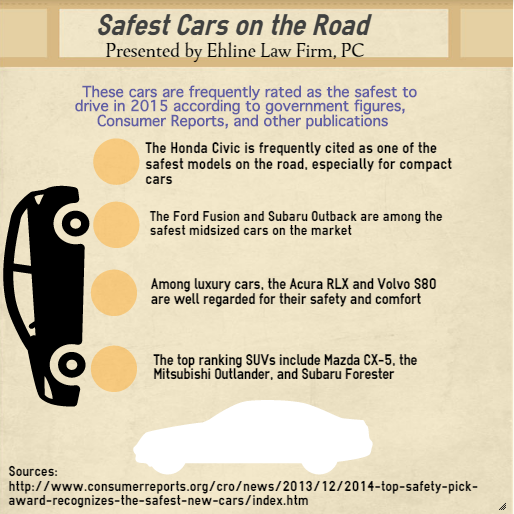 Ehline Law’s attorneys have seen people in cars that had their lives saved by their choice of vehicles. You might keep your eyes peeled to the Sigalert real time traffic map of Los Angeles, especially considering the near constant road work. The clogged highways are a constant concern. These different roads offer unique challenges for the motorist and pedestrian. In many studies, the majority of the most congested roadways in the country are in California and usually clustered around the greater LA area. According to the Texas Transportation Instituteís 2005 Mobility Report, Los Angeles was the city in which motorists lost most of their time stuck in traffic. Not only was it number one in the country, but by a large margin. As a matter of fact, the Harbor Freeway/CA-110 NB corridor– just 3.1 miles in length, results in 1.44 million hours wasted for motorists a year, and a total of 2.17 million gallons of gas a diesel wasted a year. Other major corridors, largely along I-110, I-605, I-405, I-10, and others are noticeably clogged at most hours of the day, becoming largely impassable during peak hours of the day. Overall, Southern California’s reputation for low pedestrian totals, expansive freeways, and a predominant car culture may mean that the traffic won’t go away anytime soon. There’s been efforts by Governor Brown and the legislature, including expanding bicycle and public transportation access that may have an impact, but chances are it will be too small to make much of a difference. When sitting behind the wheel of a just-wrecked car or waiting in the emergency room, the thought to contact an attorney pops in your head. There are many reasons to do so, but who to contact and when may be a concern. Ehline Law’s reputation speaks for itself. Our experience throughout California helping hundreds of clients successfully is second to none. We have also been able to make sure that our clients are well taken care of until their recover medically and financially. Our knowledge of the field is as extensive as our personal attention. It’s important to remember that our firm acts on contingency, not asking for any money unless we recover for our clients. We don’t want to add another burden on them– we want them to focus on recovery. We also can help find the right doctors for to help with different ailments no matter what part of the recovery timeline you are on. In some cases, we can even help pay for these specialists up front. We are also adept at challenging corrupt insurance companies that look to reduce or eliminate any payouts to accident victims. Of particular interest, we will not stand for violations of consumers’ own insurance policies. We refuse to quit, even if the situation is difficult. And we will fight like banshees for our clients non-stop. And we do so both in and out of court. If you are not sure whether to call us or not at (213) 596-9642, please do so. We offer a free, no-pressure consultation to weigh your legal options. We will come to you anywhere in the state to discuss your case. Frequent Causes of Los Angeles Auto Accidents. There is never just one factor in car and truck accidents. There many often be an intersection of various factors that lead to the crash. Most often, these accidents are caused by driver error. We have seen many cases of a driver operating the vehicle while under the influence, texting and driving, or distracted. There can be other reasons, including driver inexperience and lack of skill. Animals in and near the road. Inadequate road construction or repair. Weather conditions, including snow, rain, wind, and sun. Using a cell phone or other electronic device. Eating or putting on makeup. Car Accidents at Railroad Crossings. Trains are a vital part of our modern economy, but also represent a potential road hazard. Modern safety procedures have made it easier to cross over railroad tracks. However, there are many cases where track signals do not work properly. The sheer size and weight of a train makes it very difficult to stop in case of obstructions on or near the tracks. They cannot deviate from their course and accidents can cause derailments. Faulty lights and signals are a leading cause of such accidents. There are also cases in which cars have brake or motor failure near the tracks, leading to collisions. These types of accidents are much more likely to result in severe injury or death compared to colliding with another car or truck. Railway crossings in cities can be a cause for extra concern, as well as rail lines that are carrying dangerous or potentially explosive content. This can be seen in focus with the 2008 Chatsworth crash that resulted in twenty five deaths and over a hundred injuries. Safety must be a top priority near these intersections. Ehline Law has handled similar cases in the past and won for our clients. Just as issues with trains can be a major concern, other forms of public transportation and construction can be as well. There have been numerous collisions between commuters and Caltrans and LA DOT vehicles over the last decade. In addition, many pedestrians and drivers have been struck by MTA buses and public trains. All of these situations involving large vehicle can cause severe injury and death. Ehline Law’s experience with bus accidents is the finest in the region. We have handled MTA and school bus accidents, allowing families to gain the financial backing to seek medical treatment. We can also challenge the government agency which allowed such an accident to occur. When involved in a car accident, all of the ramifications are not immediately clear. For the driver and their passengers, there can be many factors at play, including severe injury or death. In many cases, these accident victims are simply not thinking of a potential lawsuit, but instead the immediate care needed for themselves and their family. When some of the dust settles, there are important steps that accident victims can take to assist themselves. They can collect the relevant data that shows the cause and effects of the crash. It is vital to follow these steps in conjunction with working with your attorney. Ask for and receive the police report. You will be asked by the police for your view of what happened, as will others involved in the crash. Being able to get accounts on paper from an official source is one of your first steps. Take pictures of the scene. Get as many pictures of the accident scene as you can. These can be with a professional camera or your iPhone or Android. Having such a record of the exact circumstances of the accident will go a long way toward showing the physical effects. Take photos of injuries. Take as many pictures of injuries, especially as the develop. This will likely be used to create a medical record that can be presented in court. Get a doctor’s report. Before you leave the doctor’s after the crash, make sure to get a written statement on your condition as well as anyone else that was in your car to create a baseline. Interview witnesses on the scene. If possible, get eyewitness accounts of what happened, including who was driving in what condition and the actions that were taken. Get as much detail as possible and write it down. Many accident victims are rightly concerned about the length of their lawsuit and how long it will take for them to recover. Of course, each case differs and there is no standard answer, but most cases we see tend to follow a similar pattern. Much of the process depends on how quickly the accident victim sees an attorney. The longer they wait, the longer the case will take. In addition, valuable evidence or information could fade with time, as can proof of injury. If a crash victim didn’t visit the doctor, an important part of their ability to respond may be gone, as well. If you are not sure how quickly to act, please give us a call at (213) 596-9642 or come and visit us at our office. Our attorneys have seen cases that wrap up in several months and others that can take years. One of the important steps along the way is to have an attorney that realizes the difficult situation you are in and will attempt to mitigate further issues. Ehline Law has gained valuable skills in being able to convince other parties to settle without going to court– which dramatically reduces the time needed for such claims. How Ehline Law Stands Out. There are more law firms than palm trees in Southern California. Also, it seems overwhelming to determine who to contact. And this is more true, if your head is still spinning from the crash. There are many attorneys that advertise on television or the side of a bus, but Ehline Law stands apart. Our attorneys have a skill-set and mindset that is completely different from other firms. Part of it comes from our background. Our lead attorney, Michael Ehline, is a disabled former Marine that understands the pain that an accident can bring. He knows the lengthy period of recovery and the potential costs– mentally and financially. He became an attorney via the same method as Abraham Lincoln, reading the law and keeps a connection with his partners and clients. We also take pride in the fact that we take such personal care of our clients. When customers choose us, we choose them as well. We can help with transportation while you are unable to drive, help find qualified medical care and a means to pay for it, and anything else you can think of. We also don’t ask for a penny unless we recover for you. Also, we have challenged all sorts of companies and agencies– and have a stunning track record of success. And we’ve taken on government agencies that did not keep the road safe. But we also challenge insurance companies. We go after them if they refuse to honor their own policies. Last, we sue reckless car manufacturers. Their large size just makes us more committed. And this is especially if that means that we can better defend the vulnerable. We don’t give up until the job is done. Let us show you why we have become so popular in the region and why we have such glowing testimonials. Call us for more information today at (213) 596-9642. Truck Accidents in Southern California. Trucks are also a major part of our modern economy, but like trains, they can cause severe injury or death. Large semis and big rigs are needed to bring goods into the LA area and beyond. Most large truck drivers are excellent and experienced, but distracted driving, road conditions, or faulty parts or repairs can cause accidents. Because of the size and weight of these trucks, there could be severe repercussions when involved in a collision with a car or pedestrian. Truck accidents are much more likely to result in a fatality. In addition, injuries that could have been relatively minor when involved with another vehicle can be devastating when caused by a truck. Effects of Texting and Driving and California Law. While texting has become more popular over the years, it has also led to an increase of accidents on the road. The use of the cell phone for all sorts of different purposes can be very distracting and cause many issues. This is why texting and driving is illegal in California since 2009. The official ticket runs between $20 and $50 but when adding in other fees can easily reach over a hundred. Similar laws are used for GPS systems or GPS apps on phones. As you can see below, texting and driving has had terrible effects on lives. Car Rollover Dangers and Statistics. Rollovers can lead to fatal accidents. There were many high-profile rollover crashes in the last twenty years, especially in SUVs that resulted in grisly deaths. Even when these types of accidents do not result in death, they can instead lead to severe accidents and traumas including paralysis. There are many reasons rollover accidents happen, including speed at the time of the accident and road conditions. Most of these types of crashes occur due to manufacturer error. In many cases it was a car maker creating a vehicle with a too high center of gravity or in other cases, tires that would blow out, causing the truck or SUV to flip over. According to the National Highway Traffic Safety Administration, these crashes are a large public hazard. While they represent just a tiny fraction of overall car crashes in the country, they also represent a full 35% of all fatalities in auto accidents. Dealing with Insurance Companies after an Accident. Insurance companies are supposed to be there when a car accident happens. You see all of these commercials on television where so-and-so corporation promises their utmost to their policy holders. Well, surprise surprise in many cases when they are needed these same companies are nowhere to be found. bath faith insurance practices are nothing new, but unfortunately many people are victimized by them every year. Thousands of insurance policies are signed with the companies having no intention of actually honoring them when needed. In cases like this, the skill of Ehline Law comes into play. We have stared down the big insurance corporations before and know their tactics. We’ve seen them send their corporate lawyers and adjustors after accident victims, hoping to whittle down the amount that they will pay out regardless of the injuries sustained or medical bills. We are able to challenge these bad faith practices and ensure the best possible payout to our clients. And we stand ready to challenge these companies in court and win– and they know it. In fact, we have settled hundreds of such cases. And we did so in and out of court. Some would say that we saved the insurance company a loss at trial. Just some of our Successes. Scroll below to see some of our biggest successes for our clients. Remember, we’ve secured over $30 million dollars for our clients over the years and will not stop until we are done. And this was for both verdicts and settlements. In a Doe v. Doe case, we successfully recovered $8,700,000.00 in a confidential settlement. In another Doe v. Doe case, we successfully recovered $4,966,255.67 in a confidential settlement. In another Doe v. Doe case, we successfully recovered $1,400,000.00 in a confidential settlement. In the case Stein v. City of Los Angeles, we recovered a million dollars for an injury victim. Read more about our victories on our Results Page. For more information, please call us anytime at (213) 596-9642 or email us using the email form on this page.